Please join us downstairs in the Fellowship Hall for an all-church potluck following worship; all are welcome, whether bringing a dish to share or not! (Please ID your vegetarian/vegan/gluten-free dishes with a Post-It note.) Following we’ll join in community conversation with a financial update on St. Paul’s, and a report from Leadership Summit, etc. Love that “table fellowship”? Sign up today at potluck or email stpaulsfmc@gmail.com (by next Sunday) to opt in for 4 X 4, to feast with a smaller group (4ish individuals, couples and/or families) several times across the Season of Easter. Groups will form based on preferred day(s) of the week; your group decides which 4 (or fewer) days/times April 22 – June 9 you’ll meet, for mini-potluck, picnic, dessert, dinner or breakfast out, whatever your group desires! You’re invited to enjoy a free hour of excellent music by Taiwanese violinist Daniel Hung and colleagues (including Joe Noble’s good friend Oliver Shon, tenor) THIS Tuesday, April 16, at 7p in Whitlock. 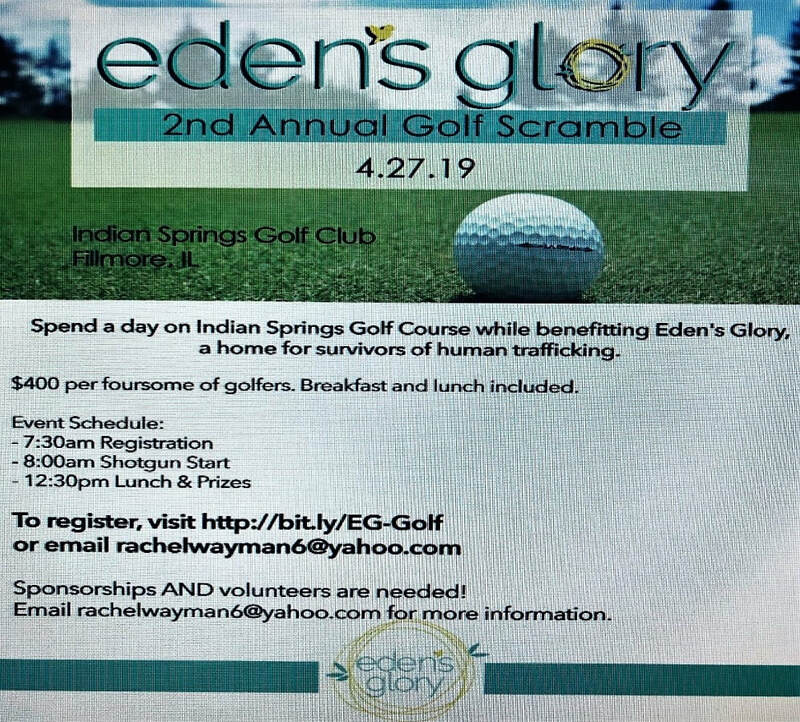 Spend a day on Indian Springs Golf Course (Fillmore, IL) while benefitting the outreach of Eden’s Glory to human trafficking survivors. $400/foursome includes breakfast (following 7:30 registration) and lunch (12:30—with prizes!) Register at: http://bit.ly/EG-Golf You may also register (or volunteer, or sponsor) by emailing: rachelwayman6@yahoo.com. Congratulations to those newly elected at our Society meeting! Our 2019-20 delegates are Elizabeth Ahern, Ann L. ​Zahniser and Eric Nord, with reserve delegates Jennifer Munshaw and Naomi Brown. (Other members of our 2019-20 Board of Administration include Dave Holden, Tim Wayman, Shannan Bernico, Pedro Valentin, and the four pastors ex officio). The newly elected Nominating Committee includes Meg File, Darlene Hartley, Jordan Hohm and Megan McPeak. Our local food pantry gladly accepts all nonperishable food (and toiletry) donations, especially canned or boxed pasta meals, soup, peanut butter, jelly, and canned meat. Please place your donations in the box in the mural room. Join us in Morning Prayer Mondays-Fridays 7:30-8:00a in the sanctuary for prayer, Scripture and Communion. Join our Adult/College/Teen Sunday School at 10a Sundays in the Mural Room for hot coffee or tea and stimulating discussion of Lisa Sharon Harper’s The Very Good Gospel. Our preschool and elementary-age (3+) children join in Godly Play Sundays on the lower level, gathering at the pew outside the carved door at 9:45a. Here they are creatively and imaginatively engaged with the church’s stories, rituals and rites, preparing for the worship and life of the church. Our preteen/middle-school Sunday School, led by Pastor Niquita, meets Sundays at 10a on the lower level. If you are a part of the St. Paul's family, please see the password protected Congregation Area for the new Church Directory Survey. COMMUNITY GOOD FRIDAY SERVICE--The final community Lenten service will be hosted by our sister Free Methodist church, Greenville FMC (1367 IL Route 140) this Friday, April 19, with worship at noon, and a complimentary luncheon immediately following; a freewill offering supports the Bond County Ministerial Alliance’s benevolence fund. JOINT FREE METHODIST SUNRISE SERVICE--Gather to worship the Risen Christ in the east parking lot of the Greenville FMC (1367 IL Route 140) at 6:00 Easter morning, April 21. We will recount and rejoice in Christ’s resurrection through scripture, prayer and song. (Alternate location Young Teen Room, should weather require.) Please do dress warmly and bring your folding chairs! EASTER GODLY PLAY & BREAKFAST POTLUCK--Our children invite us to the Godly Play room at 9:45a to hear the Easter story with them; we’ll then adjourn to the Fellowship Hall, in place of our regular Sunday School schedule, to share an Easter Breakfast Feast together in St. Paul’s favorite potluck style. EASTER WORSHIP AT 11:00 A.M.--Celebrate the Resurrection of our Lord with us in worship on this, the highest day of the Christian year! This Easter Sunday four of our acolytes will complete their confirmation class by sharing with us what it means to them to affirm their baptism.